Christmas Day may be over, but I'm still feeling the Christmas vibes and yea the coming New Year! Oh how time flies. Anyway, how was your Christmas? I hope you were able to celebrate it with your loved ones, which is what really matters. 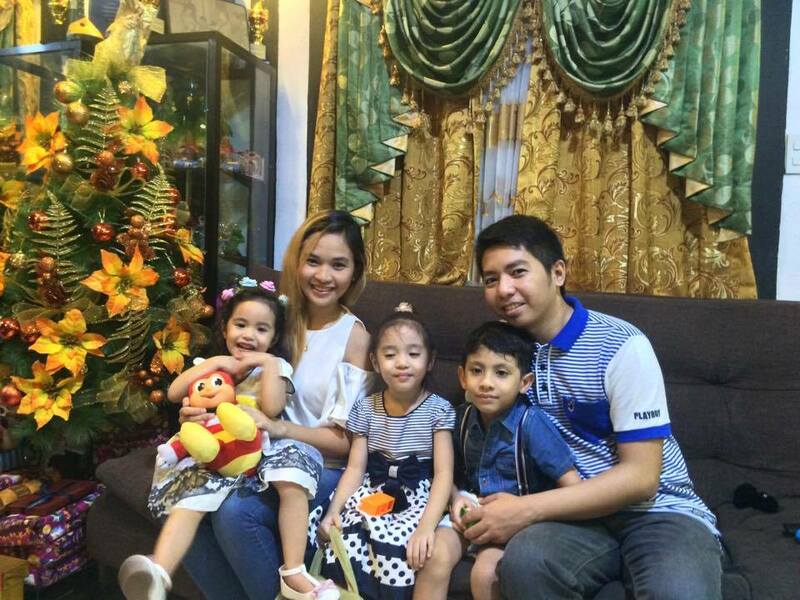 As for me, it was a bit sad, but nevertheless I'm glad that I celebrated Christmas Eve with my family over a simple Noche Buena feast. On Christmas Day, we went to attend the mass which is our family tradition and then we had dinner at Dampa with my in laws. Okay so right now, I'm really curious about what you prepared for the Noche Buena. I believe that in festivities like Christmas, Pansit, Spaghetti, Fried Chicken and Buko or Fruit Salad are staples in most Filipino families. We all had those 4 dishes last Christmas Eve plus we had ham and fruits. I've been cooking creamy tuna spaghetti ever since I learned how in 2013, but this time around, I cooked Carbonara for the first time. 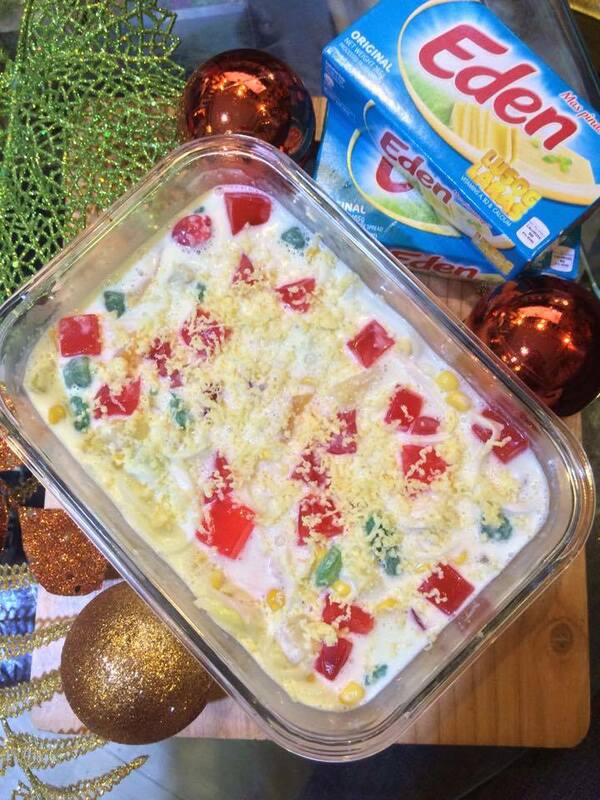 At home, we love buko/fruit salad, we even make some even though there's no occasion and for the first time ever, I tweaked my original buko/fruit salad recipe. This time, I added Eden Original Cheese in it. About two weeks ago, Eden Cheese sent a Christmas gift beautifully wrapped in a Christmas package. 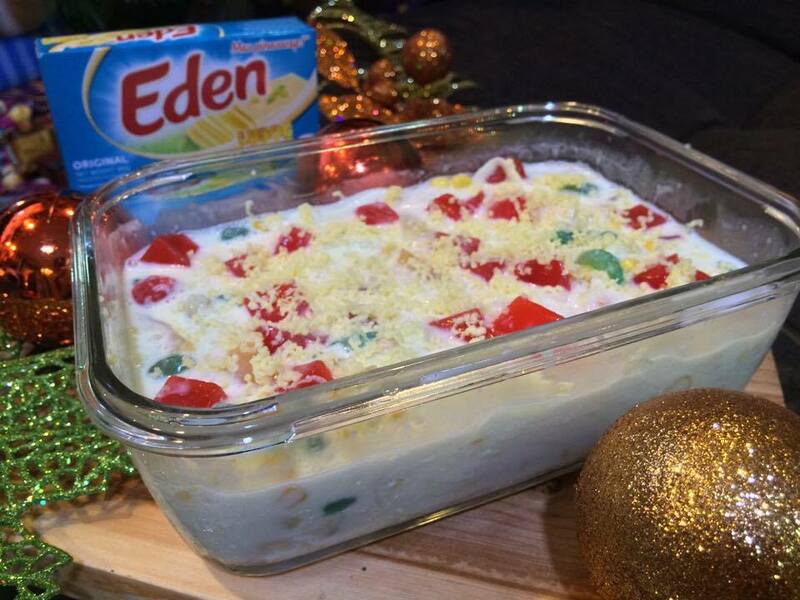 It contains ingredients for buko/fruit salad and Eden Cheese original. It may not be new to some, but cheese in a buko/fruit salad is something we've never tried before, so I was quite surprised and excited at the same time. And, surprisingly, it turned out great! It was, cheesy and creamier! 1/2 cup shredded Eden Cheese - for garnish. 1. In a large bowl, combine young coconut fruit cocktail, pineapple, corn, kaong, nata de coco, Eden cheese, condensed milk, and cream. Stir gentle to distribute. 2. Chill for a few hours or freeze until firm. 3. Garnish with shredded Eden cheese when ready to serve.